Place butter into a microwave-safe cup and heat on high in microwave until melted, about 20 seconds. Combine sugar, flour, milk powder, baking powder, cinnamon, and salt in a small bowl; add water and stir. Transfer sugar mixture to the mug and stir with a fork until batter is well mixed. Add peaches to top of batter. Heat in the microwave on 70 percent power for 2 minutes. Let mug stand in the microwave for 1 minute more. Cool slightly. Turn fresh peaches into sweet, outrageously delicious cobbler. Amazing! Probably not a good thing that I tried this recipe! Now I can have peach cobbler any time I want. I used milk instead of water and it came out perfect. The only change I made was to use fresh peaches. 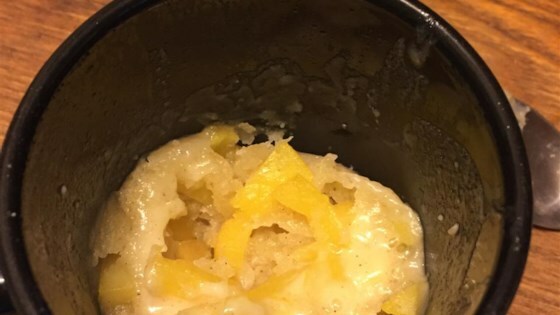 The flavor was good, but the cobbler never set after cooking for 3 1/2 minutes. Not a favorite of mine. I used wet milk instead of dry milk powder, so I'm gonna try this again sometime.